Create Text Collages with your photos. Your Photos appears in words creating Picture in Picture Effects and creating word collages for your pictures. Text photo collages lets you add stickers over photos, Text to your collages and more feature to create a solid Photo Collages made of word collages. Text Photo Collages helps you Create Photo Collages with Text, People Standing in Collages to Create Picture Text, Fancy Name Text, Shape Collages, Cascading Photo Effect and PIP Photo Frame. Text Photo Collage helps you combine multiple photos with various frame patterns and photo grids, then share them at a time! Text Photo collage Maker is the glorious photo collage. Text Photo collage Maker Give you different text style photo, fancy text styles, photo collages styles, background textures, Stickers with efficiency to Photo Filter Effects. - Text Photo Collage Maker lets you build text style Photos in grids with different background textures, tons of Stickers with ability to Photo Effects. - Simple touch gestures to rotate, re size, and delete. Add Multiple Text photo collage as many as you want. 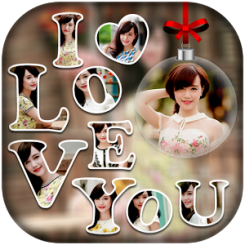 - Set each and every alphabet with your photo and create gorgeous photo collage. - Add Fancy text to any of your photos easily with just one tap. - Simple touch gestures to rotate, re size, and delete. Add Multiple fancy photo collage as many as you want. - Choose from 200+ designed layout styles and instantly create photo collages that look better than other collage maker. - Give you 50+ Photo frames for Baby, Love, Wedding, Birthday & Flower. - Easily Select your photo from you gallery album and Create beautiful photo frames. - Best and First Square cascade effect to make your photo more beautiful. - Select the cascade range of photos and choose range of blur effect that make your photo more awesome. - Select Center Mask for set your photo into that mask. We give you beautiful photo mask. - Insta Square Size Collage Maker is best photo editor, square, snap-face photo stickers and collage maker photo for Instagram. - Easily Change Square Size Photo border as you want. - PIP Collage Editor lets you set a photo in another photo with the creative frame. Easily making your photo more stunning than other photo frames! - Choose different PIP frame that match your best photo. - Photo mixer let you to add multiple photos of your choice for photo size as you want. - Simple touch gestures to rotate, re size, and delete any photos. - Various types of Sticker & fonts for adding text on your photo mixer collage. - Choose Your photo from gallery and start editing. - Add best snap-face Sticker and creative text on your photo to make best funny collage pic. - Friendly interface, simple design, easy to use and collage to make photo grid. - Set best texture background to your creative photo collage. Best HD texture theme background give you for your photo collage. - Add multiple photo text to your photo collage. - you can change text style, apply shadow and set background color and transparency easily. - Two finger gesture to move around photos,resize photos and rotate photos. - Created photos could be saved in your albums creation so you can see your collection. - Share your photo mixer photos via any social app platforms. If you enjoy using our app. Please take a moment to review us and give your comment to help us further development. Thanks for your support! If you like this app, then share with your friends and family as many as you can. Regarding any query and problem of this text photo collage app, then mail us. We happy to help you to solve any query and problem.